In Ancud visit the exhibit of the UNESCO World Heritage churches. Then this tour takes you to the churches in Dalcahue, Castro, Nercon, Vilupulli and Chonchi. These are fine examples of the wooden churches of Chiloe built in the 17th century. REGION: North Patagonia ACTIVITY LEVEL: 1 (Easy ) DURATION: Full day (8 – 10 hours). MIN. / MAX. PEOPLE: 4-8 people (more by arrangement) SEASON: From October to March, weather permitting. INCLUDED: Professional local guide (with Wilderness First Response guide accreditation), VHF Communication radio/mobile phone, 1 mineral water & snack per person and private transportation. NOT INCLUDED: Travel insurance, personal equipment, lunch, tips or anything not listed in the program. GUEST PROVIDES: Comfortable clothes appropriate to the activity. TOUR OPERATED BY: Patagonia SouthernLand Expeditions staff. We leave from your hotel in Ancud or other arranged pickup. Our first stop is the former Convent of the Immaculate Conception in Ancud which is today a museum. It houses the center for Foundation Friends of the Churches of Chiloé, the carpentry workshops for the restoration of churches and Visitor Center. We learn about the unique School of Religious Wooden Architecture of Chiloé and see the significant style of design and construction used in building these wooden churches without nails and special interlocked joints. The ceilings of the churches are built like the ribs of a boat. 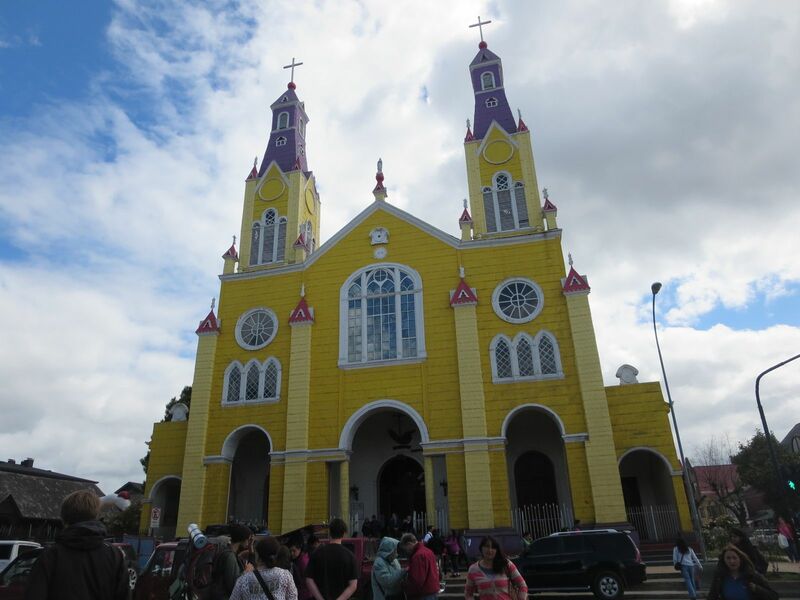 In Chiloé, there are about 60 churches built within the framework of a Circular Mission introduced by the Jesuits in the 17th century and continued by the Franciscans in the 18th and 19th centuries. In this tour we visit at least 5 of the 16 most exceptional examples of this unique form of wooden ecclesiastical architecture, with its successful fusion of European and indigenous cultural traditions. The abilities of the people of Chiloé as builders achieved its highest expression in these wooden churches, where farmers, fishermen and sailors exhibited great expertise in the handling of the most abundant material in this environment, wood. These churches stand near the coast. Most of them are protected by the northern mountains and have a southern front door, so that they were sheltered from the rain. Churches are often facing an esplanade that turns into a square or just a simple space hedged by trees. Its size is not only related to the church dimensions, but also to the importance of the religious festivities held in the surroundings. After our briefing at the Foundation Friends of the Churches of Chiloé Center, we will drive for one or two hours to visit the UNESCO World Heritage Churches of: San Juan in Dalcahue village, San Francisco in Castro the capital of Chiloé, Nuestra Señora de Gracias in Nercón village, San Antonio de Vilupulli and Nuestra Señora del Rosario in Chonchi, where the festivity for San Carlos de Borromeo is celebrated each year on November 4th. Also during our trip, we visit some artisans at local handcrafts markets. Lunch on your own in one of these areas. We return to Ancud in time for dinner on your own.